Okay, who else is dying in this heat? Because I know I sure am! With that being said, it’s OFFICIALLY summer. So what’s easier to just throw on and go other than a romper? They are my go-to & we are so ready to share this one with you, just in time for the 4th of July! You can even jazz it up with this necklace! Here you will find a video that walks you through the whole process of creating this garment (hope the music puts you in the summer mood!) If you are a beginner, don’t worry, we have provided a simple walk through! If you are more advanced, we have accommodated you through the use of using your serger! Check out these new cotton prints from Riley Blake. Not brand new, but oh so cute! 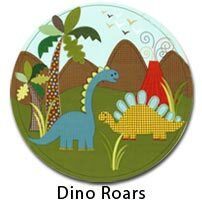 Dino Roar is a really cute collection. 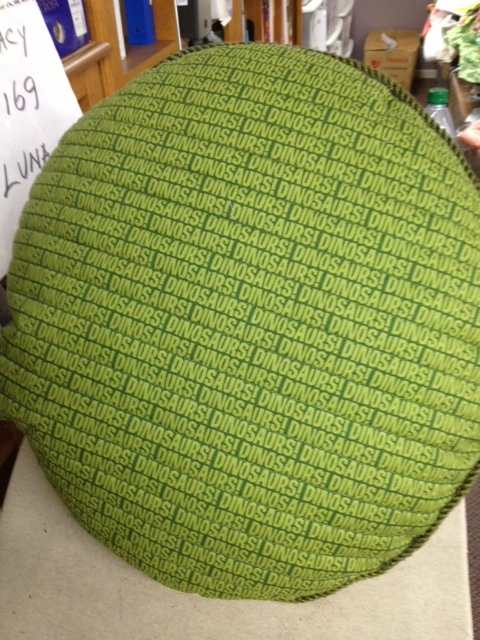 I was walking between my two offices yesterday and came across this pillow that one of our buyers in almost done making. 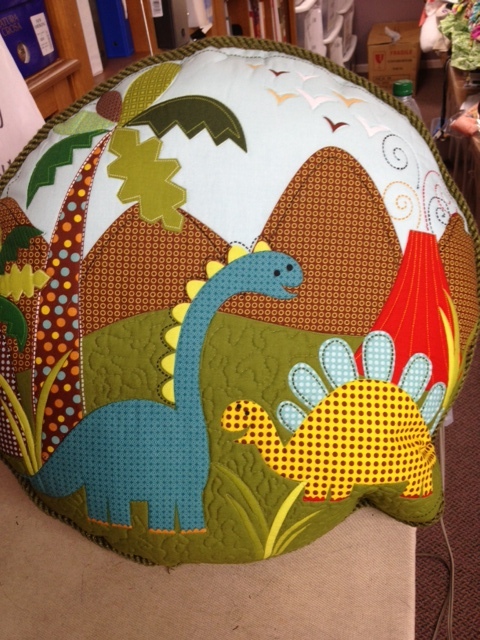 She used the panel, the Dinosaur word print, and some green/olive piping and bam! an adorable pillow that is really simple to make. Here are a few pictures.It is not quit done, but I couldn’t resist. All she needs to do is finish stuffing it & sew up the seam. It should be on the floor any day now. 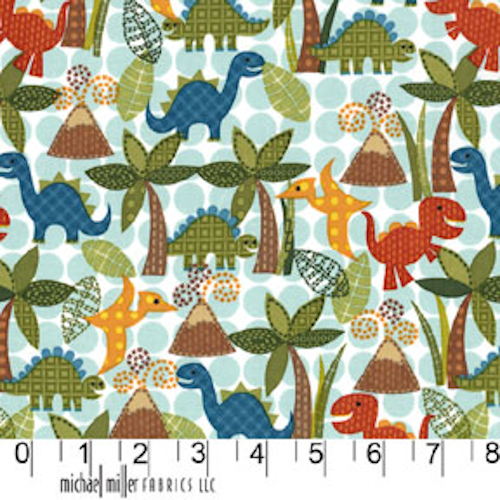 On the Michael Miller site there is a really cute quilt. 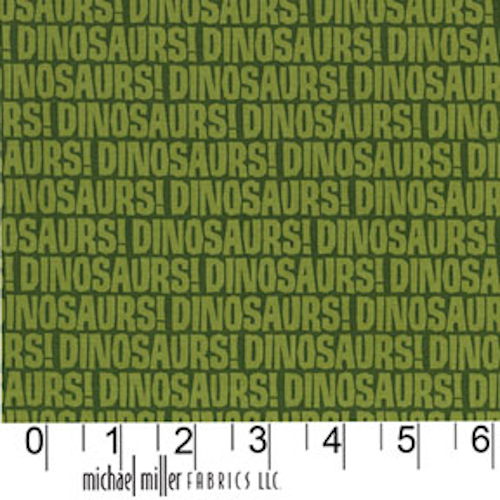 Perfect for any little boys room. Also great as a party theme or for crafts. We’ve had Echino in the retail store for awhile now, but I was so happy when I heard I was getting stock and able to put it online. It’s beautiful, modern, and fun. 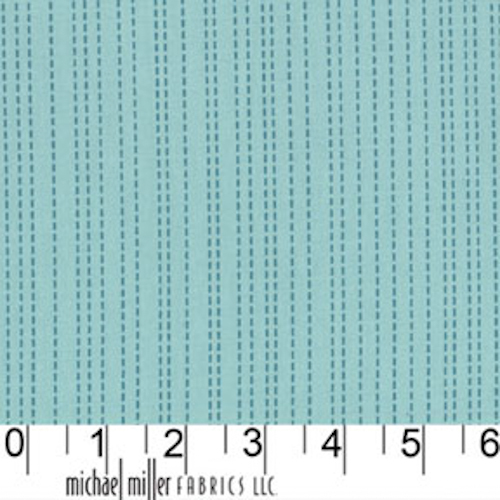 Echino is a line of fabrics designed by Etsuko Furuya. She graduated from Department of Textile Design Textile Kyoto Art College. On her website you can see more of her works, including ceramics, bags, and of course her full line of fabric. Honestly it is hard for me to pick which one I like the best. The colors of the Echino are so vivid and the prints are so quirky, it really has a great range, and for me that always make a fabric appealing. Check out this web site for some inspiration. I love the peasant dress style. The first year it makes a lovely dress, but what I love even more is the second year, when they have a growth spurt, and the dress turns into the perfect tunic top over simple leggings. Check out this Messenger Bag…. While the directions are in Japanese I have been told most sewers can figure it out. Here are just a few pictures to get you inspired to buy a piece, or two, of this great fabric. Need the purse hardware, buy it here. 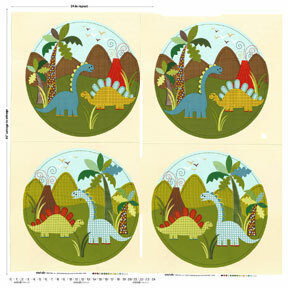 We have both these patterns, as well as many others, that would work great for these prints. Enjoy! Our owners just arrived back from Quilt Market, and therefore I have cotton on the brain. Over the next month or so we will be getting in lots of great new cottons and flannels. Hopefully they will give me a list of what is coming in month by month and I can post a coming soon section. From what I have seen, looks like some really great prints. For today, I just wanted to show you a few projects, both cotton and flannel, that are going up in the store. First the new California cotton print from Timeless. In one yard you get the best of California. 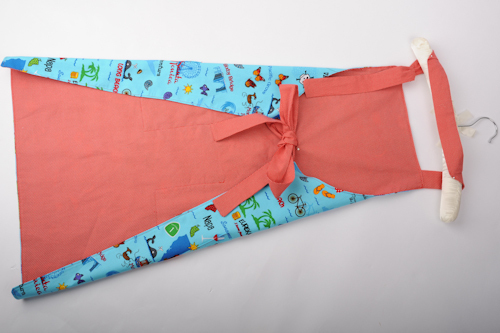 Our sample maker decided top make an apron from it. 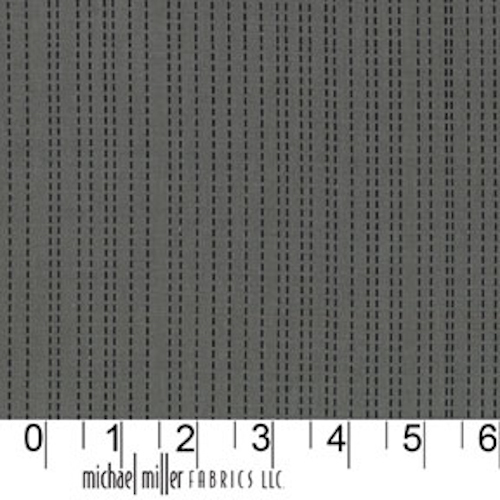 This free Apron tutorial is very similar to the apron shown here. 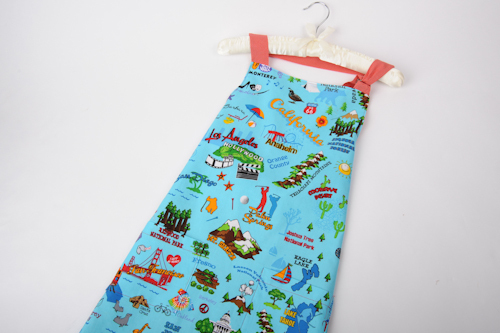 Again, while I love this new print, remember to check out all our cotton prints and pick one that is just right for you or the person receiving this great apron. Another cute line we’re featuring with a sample is Marmalade Flannels and Vintage Modern Flannel from Moda. We have it in both cotton and flannel. Both these collections have the wonderful feel of the good ol’ days. They have found a way to take vintage charm and add a bit of modern geometric flair. Both collections have an assortment of prints to pick from. In this stroller blanket we used three of them. Click here to see the entire collection. This blanket was made from a super easy pattern, not even really sure you can call it a pattern, more just a sheet of directions. 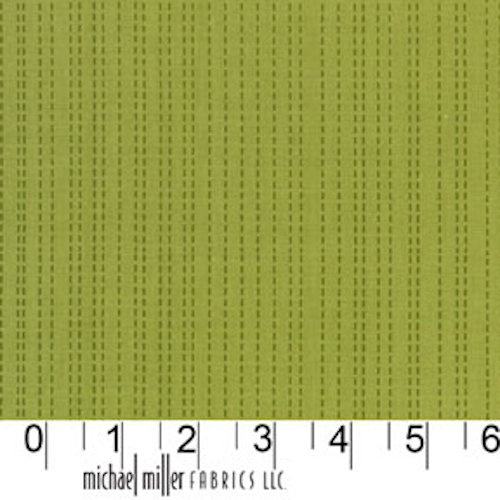 Basically you get 1 3/4 yards of a one print and 1 1/4 yards of another print (cotton or flannel) and approximately 3 2/3 yards of ric rac or a contrast bias binding. You should always pre-wash both pieces before you cut them. Cut both pieces to the same size, 40′ by 42′ square. To add ric rac, put both pieces of fabric right sides together adding ric rac in between the two pieces. Stitch around the edge of the blanket leaving an opening of about 6 inches. Turn the blanket right side out and stitch the opening closed. Iron with steam. If desired, ric rac can be added to the outside of the blanket on the flannel side for a decorative look. 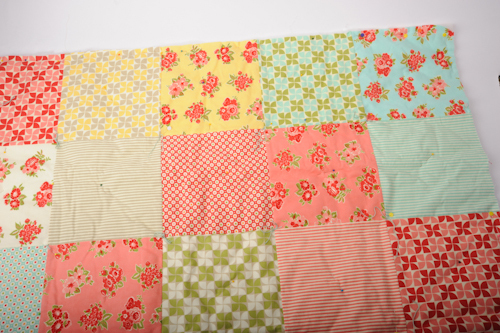 Simply sew the two pieces of fabric together right sides together, turn right side out, close the opening, and add the ric rac on top to finished blanket. To make a blanket with binding, put the wrong sides together and add the binding edge on top of the cotton print side edge. Stitch 1/4 inch seam allowance around the blanket. 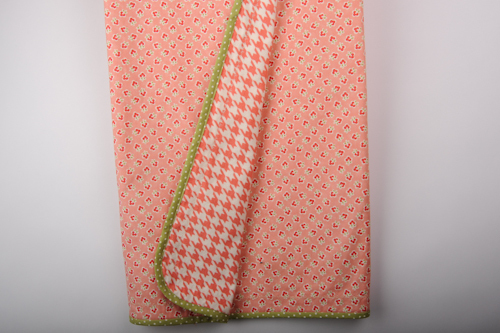 Fold binding edge over to the back of the blanket and blind stitch by hand or machine. The last sample is from the same collection. It is still in the process of being sewn, but I just wanted to give you a peek at this great patch work blanket. It is hand tied and not quilted. Really cute & simple. 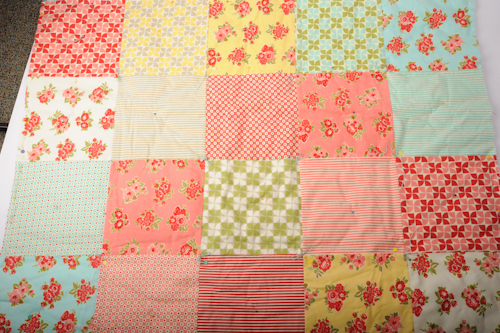 Again, I love this collection, and this quilt really shows off many pieces from it,but if you find yourself with less time than you anticipated you could buy our fat quarters, coming on-line next week, and whip it together in no time. That’s it for now. 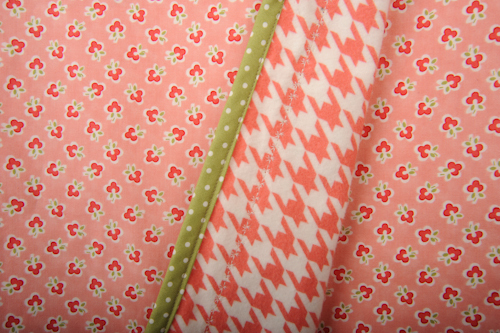 Keep checking our site all month for great new cotton and flannel prints. Also remember all our cotton and flannels are 10% off everyday. Just a quick post to let all of our blog followers know about our monthly online sales calendar for April!!! I see discounts on cotton prints, buttons, bridal laces, home decor silks, swimwear prints, and patterns are in your future… Click on the image to visit our online store! Liberty of London Spring Sale at Michael Levine’s & LowPriceFabric.com! The temperate spring months leading into summer are a perfect time to adorn oneself in the high quality wares of the famous London design house, Liberty. Synonymous with the ideals of British design, this brand has become famous for its detailed prints on exquisitely woven cottons and silks that have lead to numerous licensing deals and collaborations with the world’s most renown luxury brands. Ever since Liberty’s collaborations with Target, Nike, and MAC Cosmetics, to name a few, their brand recognition stateside has skyrocketed. Now opened up to a whole new market of home sewers and designers, the Liberty print fabric collections are highly coveted. We love Liberty of London here at Michael Levine, and to say we make fuss about any new Liberty shipments would be an understatement! This week, we celebrate Liberty of London and make way for the new collection with a clearance sale of 20% OFF all in-stock Liberty of London cotton & tana lawn prints; sale starts Monday April 2nd, 2012 and ends Wednesday April 4th at midnight EST. A Nike sneaker featuring Umbel print, available in cotton lawn at LowPriceFabric.com! If you’d like to shop our current stock of Liberty art prints, click here. Either way, there’s plenty of Liberty to go round and now’s a great time to indulge if you’ve been holding out! Sale ends Wednesday at midnight EST.